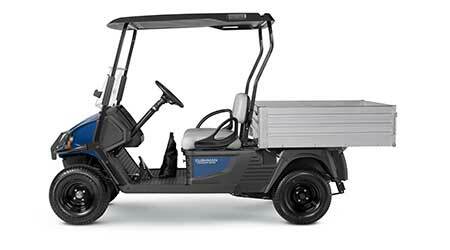 Cushman, a Textron Specialized Vehicles brand, introduces a truck-inspired line of Hauler utility vehicles that are designed to effortlessly cut the task list down to size. The practically designed new Hauler 1200, Hauler 1200X, Hauler PRO and the Hauler PRO-X offer more payload, a larger bed, and affordable accessories. The new truck-inspired Hauler can be customized to include either a sound-dampening 12-cubic-foot durable roto-molded polyethylene bed, or the upgraded 15-cubic-foot fully aluminum bed for extra space. The standard poly bed includes integrated divider slots to allow for increased organization and customizable bed storage. The aluminum bed features an L-track bed system that can accommodate hooks and brackets for convenient tie-down locations and space-saving accessories. • Optional 12V or USB outlets, to ensure tablets and smartphones don’t lose power. The new lineup of Hauler utility vehicles includes a highly functional dash that provides a clean, unobstructed line of sight for anyone behind the wheel. The new dash centralizes the control panel that houses everything from the directional key switch and standard horn to the optional state-of-charge meter and bed-lift switch.